Bow hunting blue wildebeest South Africa with Mkulu African Hunting Safaris. Bow hunting blue wildebeest South Africa with Mkulu African Hunting Safaris. 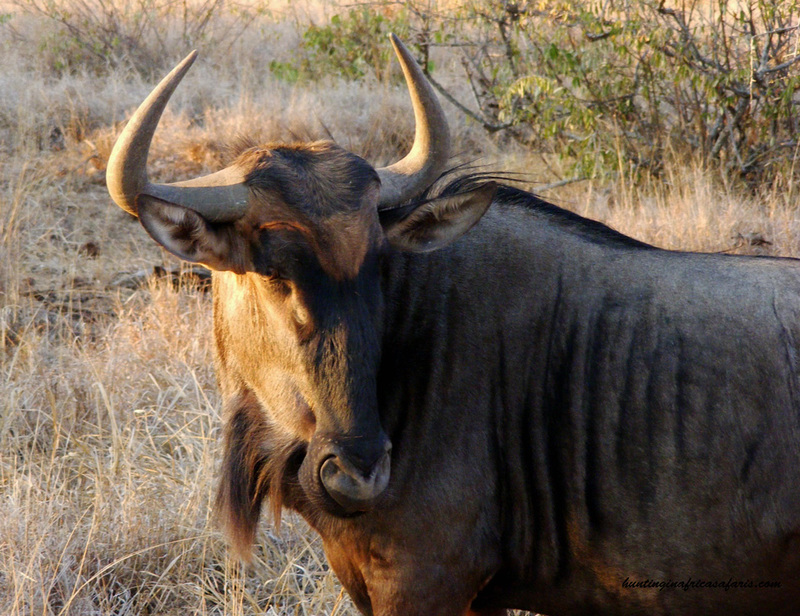 The nickname Poor Man’s Buffalo is derived from two aspects: firstly, the blue wildebeest looks like a buffalo at a quick glance, and secondly, they are just as tough as Cape buffalo. Shot placement when bow hunting blue wildebeest is of the utmost importance. The vitals are located low in the chest cavity leaving a lot of open, barren space between the top of the vital organs and the top of the hump on the back. darker stripes down the flanks of the animal. 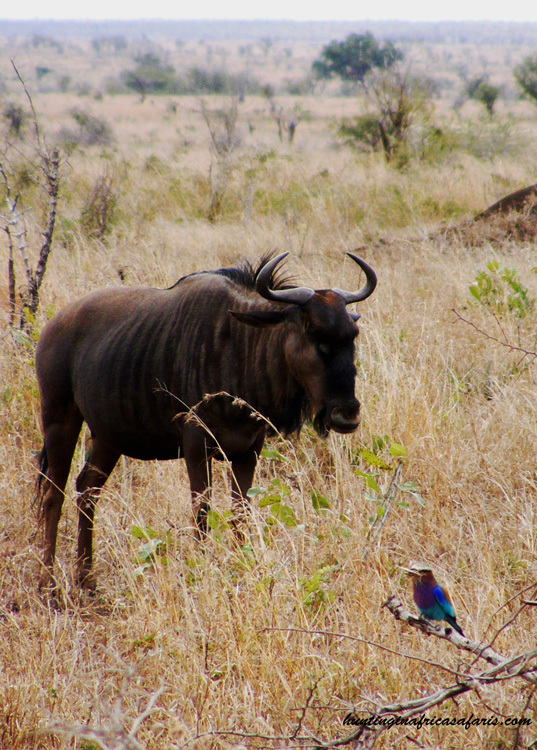 The word Gnu is derived from the communication sound made by the blue wildebeest usually early mornings and late afternoons. Adequate bow hunting equipment should be used. The bow must be fine-tuned and fixed blade broad heads should preferably be used. Having a bow hunted blue wildebeest in your trophy room is to have one of the top 10 most desired bow hunting trophies of Africa. The blue wildebeest bow hunting prices 2019 South Africa is $ 1 100 for the duration of the African bow hunting season. The recommended draw weight for bow hunting blue wildebeest in South Africa is any increment greater than minimum draw mass. Any draw weight greater than 70 lb is recommended for bow hunting blue wildebeest. Average shooting distance when bow hunting blue wildebeest in South Africa from our bow hunting blinds are seldom further away than 19 to 25 yards from your trophy blue wildebeest. A minimum arrow velocity of 245 fps is suggested for bow hunting blue wildebeest in South Africa. A minimum arrow weight of 450 grains (gr) is suggested. Rage II mechanical broad head. A fixed blade 2-blade broad head with bleeders. juvenile (likely young bull), very old bull and a cow. Blue wildebeest have a rather large area covering the vital organs for adequate shot placement. Place the shot right on the shoulder in line with the front leg, slightly less than one third of the way up from the bottom of the chest to the top of the back. This shot should result in a high heart / lung shot leading to the blue wildebeest expiring in the least amount of time. On a quartering to shot it is recommended to place the arrow midway between the angle formed by the front legs, approximately where the neck joins the brisket. These shots are mostly risky and should only be attempted by experienced bow hunters using bows with a draw weight in excess of 80 lb. 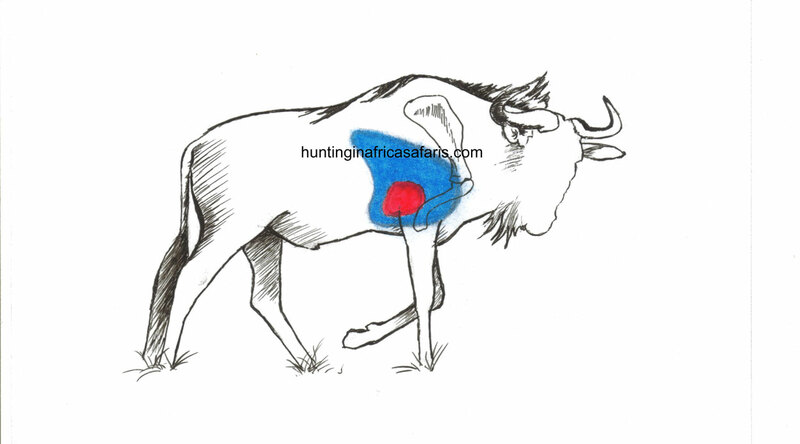 The following tips for bow hunting blue wildebeest are done from the perspective of still hunting from a blind. Blue wildebeest usually come in to water during the mid-mornings anywhere from about 9 am – 11 am. They arrive for a second round from about 3 pm onward till dusk at about 5:30 pm (during our winter months). Blue wildebeest come to water cautiously and weary the whole time. Blue wildebeest will often stand some distance away from the water and approach a few steps at a time. Due to the availability of these animals they are one of the 10 most popular animals to bow hunt in South Africa. 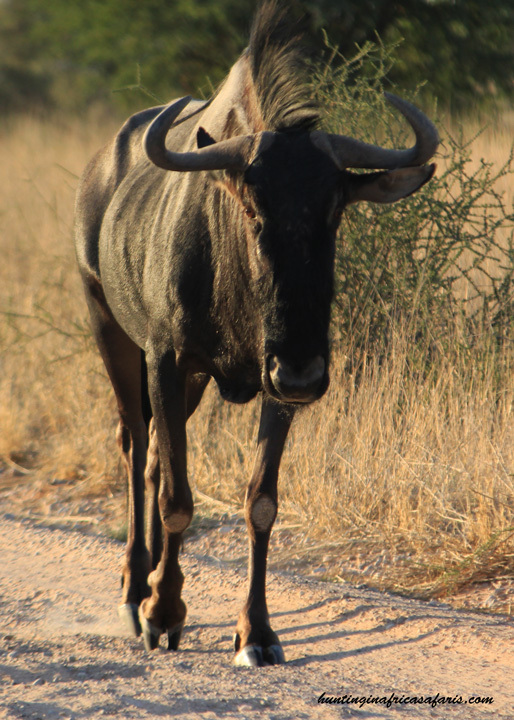 The blue wildebeest rut starts roughly after the fourth week of April (can differ slightly according to different regions and from year-to-year) and lasts until about June. During or after September the bulls form bachelor herds and even may become solitary. We suggest the best time of year for bow hunting blue wildebeest in South Africa would be between May and October lasting from the start of the blue wildebeest rut to almost the end of the dry season. We can and do bow hunt blue wildebeest from January to December.